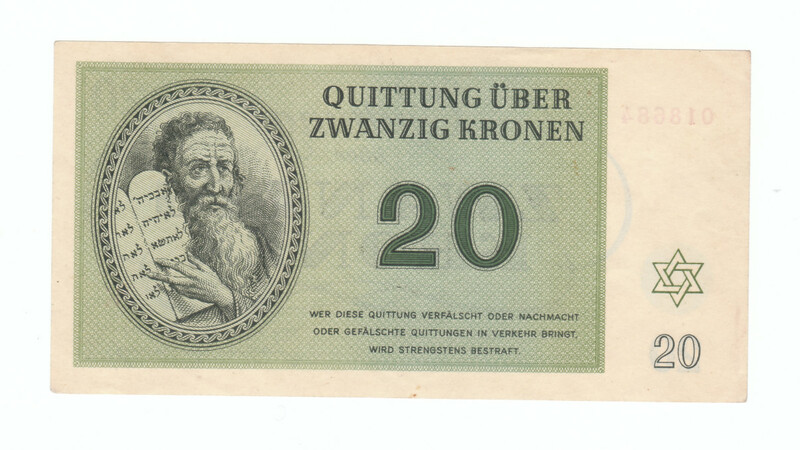 Like in other concentration camps during World War 2, the Nazis, during the latter part of 1942, decided that in the ghetto of Theresienstadt the Jewish inmates should not use normal money for payments but special currency, only valid in the ghetto. In 1944, it was used for the plans the Nazis had to fool the International Committee of the Red Cross, the ICRC, which had planned to inspect the ghetto. 2. The Ghetto of Theresienstadt. 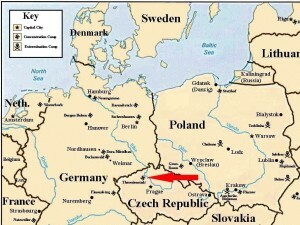 After the occupation of Czechoslovakia in June 1940, the Gestapo set up a prison in the ‘Kleine Festung’ (Small Fortress), just outside the city of Theresienstadt or ‘Terezín’ on the east side of the Ohře river. During the War, more than 32,000 people from many of the countries occupied by the Germans were imprisoned for various reasons. However, most of them were political prisoners. As from November 1941, the SS started to use the ‘Große Festung’ (the Main Fortress), the walled section of Theresienstadt, as a ghetto for Jews. 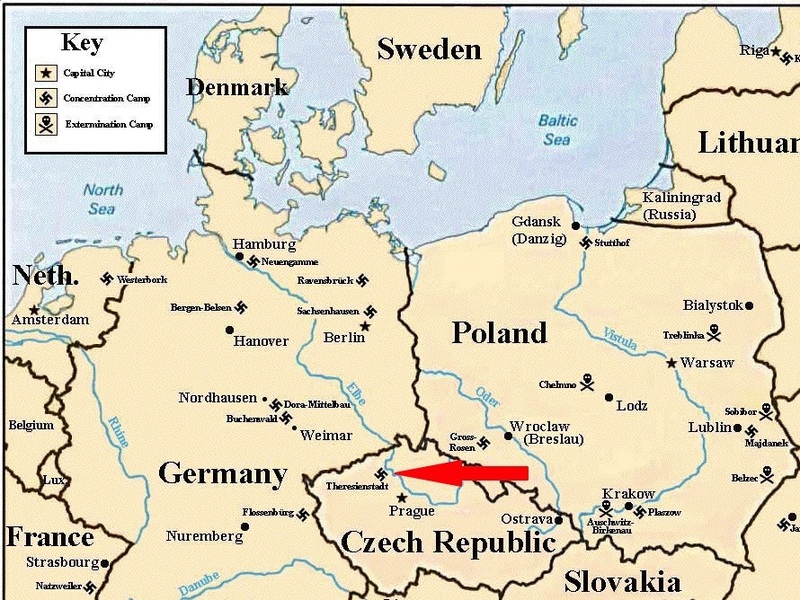 Approximately 144,000 Jews were sent to Theresienstadt during WW2, most of them were Czech Jews, however, many came from Germany, Austria, the Netherlands and other occupied countries. About 88,000 of them were deported to extermination camps like Auschwitz. Many inmates died in Theresienstadt as a result of hunger and diseases, like the typhus epidemic right at the end of the War. About 15,000 people had survived Theresienstadt by the end of WW2. © Yad Vashem Photo Archive. 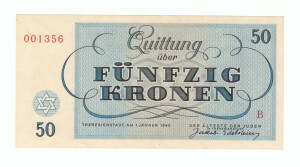 As stated above, it was decided that special money should be used by the inmates of Theresienstadt instead of normal money. This money was only valid for use in Theresienstadt. 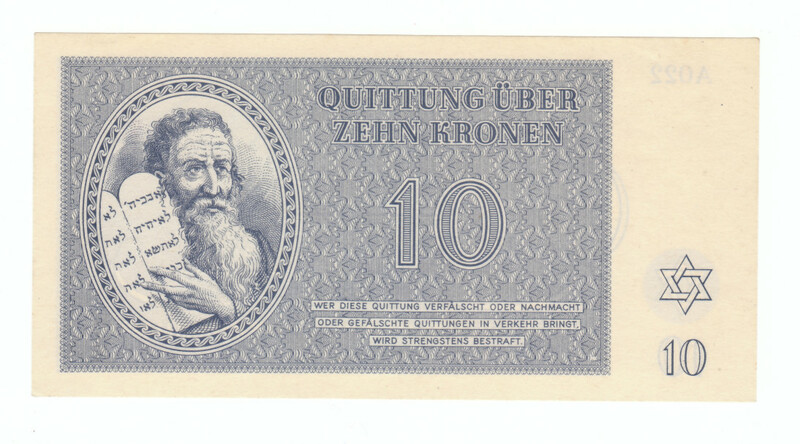 The banknotes were designed by the Czech writer and artist Peter Kien, who was born on January the 1st, 1919, in Varnsdorf and deported to Theresienstadt at the end of 1941. 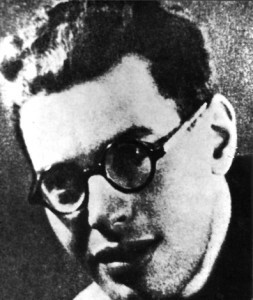 He died in October 1944 in Auschwitz. 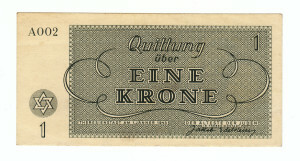 On the front there is a cartouche with the inscription ‘Quittung über’, meaning ‘receipt of’ and the denomination in 1, 2, 5, 10, 20, 50 or 100 ‘Kronen’ (Terezinska Koruna), place and date of issue: ‘Theresienstadt, am 1.Jänner 1943’ (Theresienstadt, January, the 1st, 1943) and the signature of ‘Der Älteste der Juden in Theresienstadt’ (The chieftain of the Jews in Theresienstadt) Jacob Edelstein. 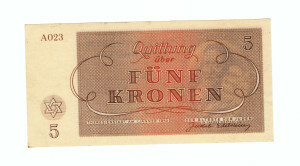 It also contains the plate number, the ‘A’, followed by a three digit number for the 1, 2, 5 and 10 Kronen in the top left corner in the color of the banknote. 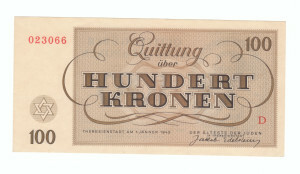 The 20, 50 and 100 Kronen have a six digit serial number in the top left corner and a letter in the lower right corner, printed in red. At the left of the cartouche we find a ‘Star of David’ and again the denomination. On the reverse there is a cartouche with on the left an oval engraving with Moses holding the two tablets with the Ten Commandments in his hands. 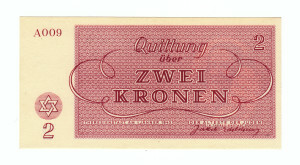 In the right part of the cartouche we find again ‘Quittung über … Kronen’ with the denomination written in letters, below that the denomination in digits and below that it is written: ‘Wer diese Quittung verfälscht oder nachmacht oder gefälschte Quittungen in Verkehr bringt, wird strengstens bestraft.’ (Who falsifies or imitates this receipt or brings falsified receipts on the market, will be severely punished.). On the right of the cartouche, again we find the ‘Star of David’ with the denomination below. 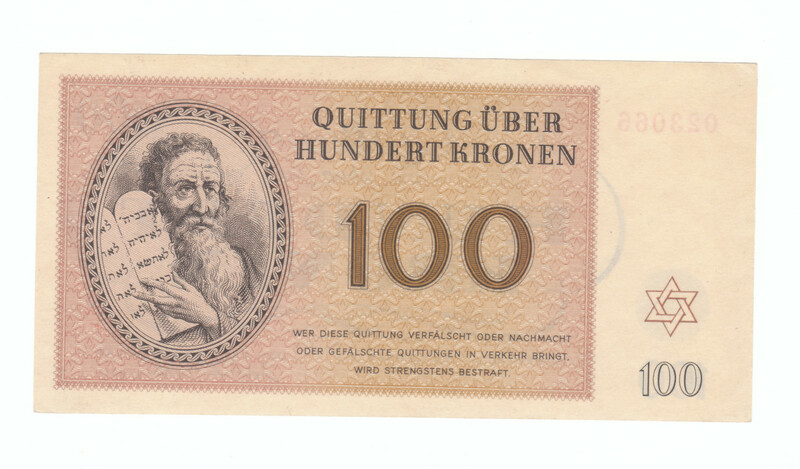 As the nazis were suspicious if the Hebrew text of the Ten Commandments on the bank notes did not contain hidden anti-Nazi propaganda, the text was verified by an expert of the University Library of Prague. The bank notes were engraved by Jindra Schmidt and Bedrich Fojtášek (other courses say Bedřich Potášek), artists that worked at the government printing-office. 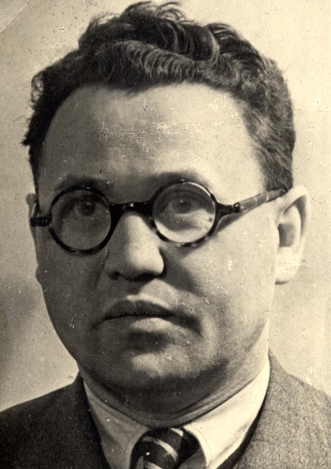 Jindra Schmidt (some say it was Kien) ran into a conflict with the Nazis, because the Nazis found that the head of Moses on the original design looked to ‘arisch’ (Aryan). So the head of Moses was changed according to the Nazi stereotype view on the Jewish appearance: he got a more hooked nose and curly hair. The bank notes were printed by the National Bank in Prague. 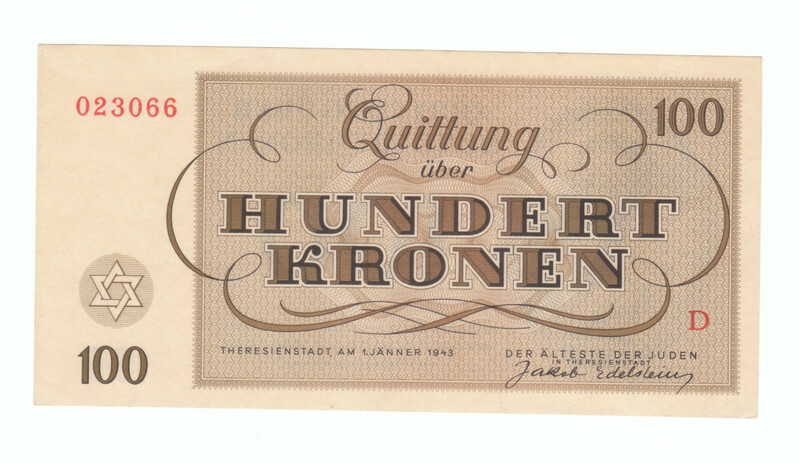 The money, with a nominal value of 53,000,000.- Theresienstadt Kronen, arrived on April the 21th, 1943, in Theresienstadt and became official currency on May the 12th, 1943. 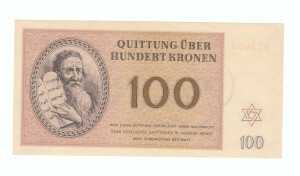 The inmates received 10 Theresienstadt Kronen for each Reichsmark, which they had to hand over to the Nazis. 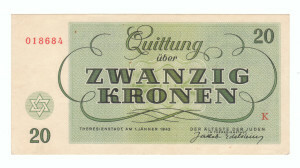 At the end of the War, the money had only little value, because there was hardly anything one could buy. It was used, for example, to make a deposit for the loan of books at the library, 50 Kronen for each book. However, many inmates preferred to keep the books and did not return them to the library to claim the deposit. Another purpose was that it could be used to pay the fee the inmates had to pay in order to get parcels that were sent to them from the outside world. A nickname used for the banknotes denomination was ‘Moses Kronen’ (‘Moses Crowns’). Moses with hooked nose and curly hair. On the internet, there are several places where we find that the Nazis required Kien the cover the fifth commandment ‘Thou shalt not kill’ on the tablets of the Ten Commandments. As you can see on the banknotes, Moses fingers cover the fourth commandment partially and the fifth one complete on the right tablet. Because Hebrew text is read and written from right to left, the first five commandments are on the right tablet. The commandments six through ten are all truncated by the boundary of the picture. I was about to check this, when I found an article written by Tony James (link see below) that this ‘fact’ in not true. So I checked with some Bible translations and found that the fifth commandment is ‘Honour thy father and thy mother’ and not ‘Thou shalt not kill’. The Ten Commandments are written twice in the Bible, in Exodus 20 and in Deuteronomy 5. James states in his article that the order of the commandments in Exodus differs from the order in Deuteronomy, I checked two Hebrew Bibles, translated in English, the ‘JPS Tanakh’ (1917) and the translation found on the website from Chabad.org and I couldn’t find any difference in the order. I found he same result in the ‘American Standard Version’ (1901), the ‘King James Version’ (1611) and the German ‘Luther Bible’ (1545). Maybe Catholic Bible translation give other results, but I did not check that. Given the fact that Kien was a Jew, it is most probable he used the order as written in the Jewish Bible (Tanakh) and that means that the fourth commandment ‘Remember the sabbath day’ is partially covered and the fifth, which is fully covered is ‘Honour thy father and thy mother’ and not ‘Thou shalt not kill’. 5. Theresienstadt as a ‘model Jewish settlement’. Theresienstadt, Czechoslovakia, Jews with their belongings, arriving at the ghetto. 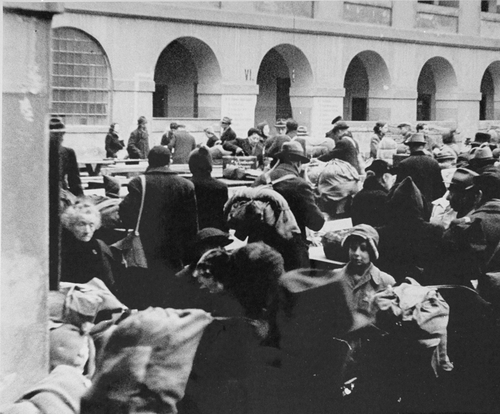 Although the Theresienstadt ghetto was nothing more than a transit camp for the Jews to the extermination camps, the Nazis did sent mostly elderly people and persons of ‘special merit’ to the ghetto. 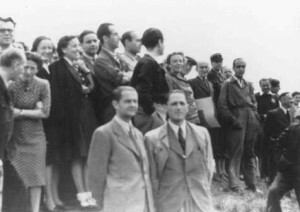 Due to the fact that the Nazis did sent several of hundreds Danish Jews to Theresienstadt, the Danish government wanted the International Committee of the Red Cross to visit the ghetto for inspection. This resulted in a plan to fool the rest of the world to make look Theresienstadt like a ‘normal’ town, in which the deported Jews could live a ‘normal’ life. Theresienstadt was the first concentration camp in which the ICRC was allowed to make inspection visits, so a plan was made to ‘beautify’ the city and to create a livable situation. 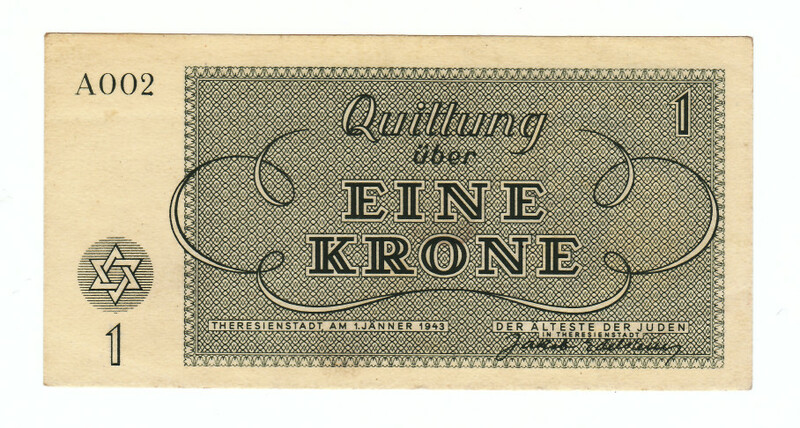 A theatre was founded as well as shops, a bar, etc… The inmates of the ghetto were able to buy second-hand clothes and other goods in these shops with the Theresienstadt banknotes. The city parks were set open for the public and there was a playground for the children. In Theresienstadt there lived, like in all other camps many, many people. But before the ICRC arrived, about 17,000 inmates were send to the death camps in order to reduce the overcrowding of the city. A scene staged by the Nazis for the International Red Cross inspection of the Theresienstadt ghetto. The people are probably watching a soccer match. Czechoslovakia, June 23, 1944. © United States Holocaust Memorial Museum, Washington, DC. During the week of the inspection cultural events were organized like numerous performances of the children’s opera called ‘Brundibar’ in the cultural hall. It was even allowed to dance on Jazz music, played by a Jazz band, called the Ghetto Swingers, played in the music pavilion in the square. This was very exceptional, because Jazz music was considered as “degenerated” by Hitler. On June the 23th, 1944, an ICRC delegate, Dr. Maurice Rossel, along with two representatives of the government of Denmark, visited Theresienstadt. The SS had carefully orchestrated this visit: he did not had any opportunity to speak with the inmates, nor did he get entrance to the fortress. The plan worked, the ICRC was fooled indeed and the ghetto passed with good reports from the ICRC. The Nazis did make a movie about Theresienstadt for propaganda reasons after the beautifying of the ghetto. Because the War was in its end of days, the Nazis had no time to complete the movie and much of it is lost, but parts of the movie still exists. For instance, there exist a scene in which we see old people waiting in a long queue in front of the bank with their saving book and the Theresienstadt banknotes in their hands, waiting to deposit their savings. The name of the movie is ‘Der Führer schenkt den Juden eine Stadt’ (The Führer gives the Jews a city’). The people who were seen in this movie were deported to Auschwitz and for the most of them did not survive the war. 6. 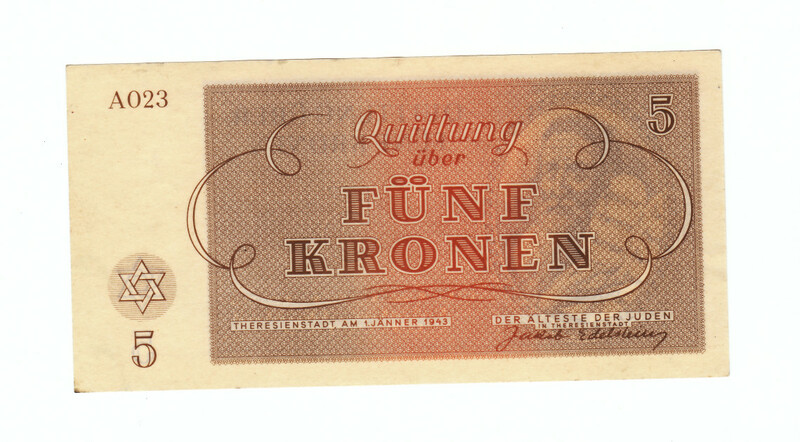 About the Theresienstadt banknotes after WW2. 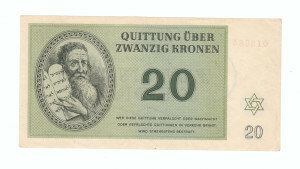 Shortly after the war, an army bulldozer operator of the American 36th Infantry Division found a large number of 20 Kronen notes while bulldozing a part of the ghetto. The exact amount was not reported, but is was enough to fill a suitcase. These notes have also been distributed. 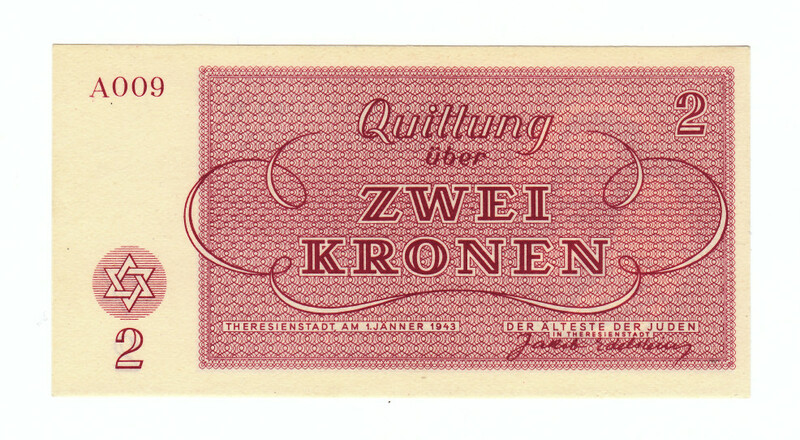 These banknotes are evidence of the cruelties that happened in WW2 against groups of people that did not fit into the warped ideology of the Nazis, being Jews, Gypsies or other groups of people that did not comply to the ideals of Hitler and his consorts. ‘It is difficult to understand the twisted mentality and humor of the Nazi SS authorities who issued such currency bearing a design featuring Moses with the Ten Commandments, the Star of David and the facsimile signature of Jakob Edelstein as the ghetto Jewish elder. 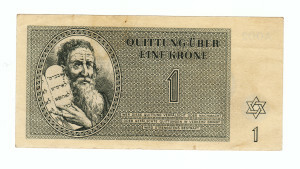 Through such currency the Nazi SS placed Moses as a prominent Jew in Theresienstadt, and mocked the Ten Commandments to the extent of violating them in almost every con­ceivable and inconceivable manner. 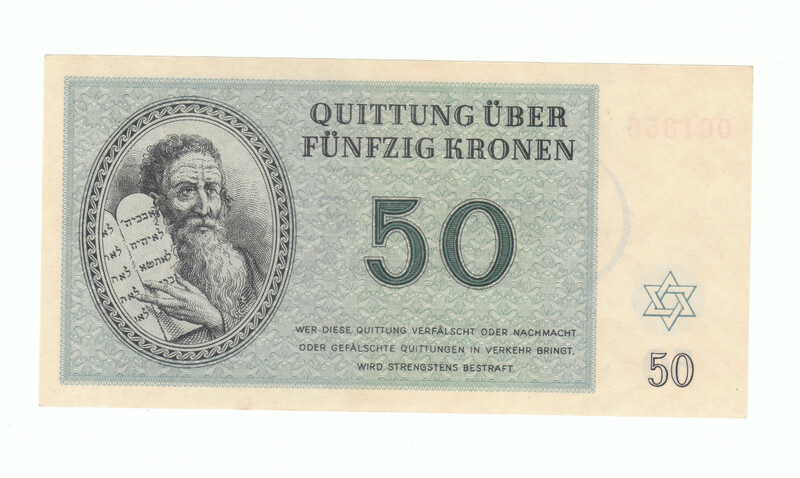 These notes survive as a numismatic memorial to the thousands of Jews who inhabited Theresienstadt, who died from inhuman treatment in Theresienstadt or who were later killed in the Nazi killing centers. 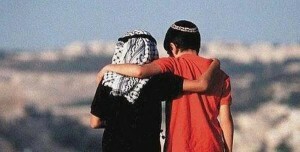 Anything war can do, peace can do better! Discriminating and/or killing of people, whose only ‘crime’ is that they are born into a specific nation, confess a different religion, or just are who they are, is despicable in all instances. Unfortunately, people do learn little out of history, as we can see in our own days, throughout the world. This seems to be rather hopeless. However, if we look at nature that surrounds us, the complexity and beauty in creation, we have to admit there is a Creator. And if there is a Creator, there is a purpose in creation, in our being here, in humanity and there is hope for this world! 8. Related links and sources on internet. 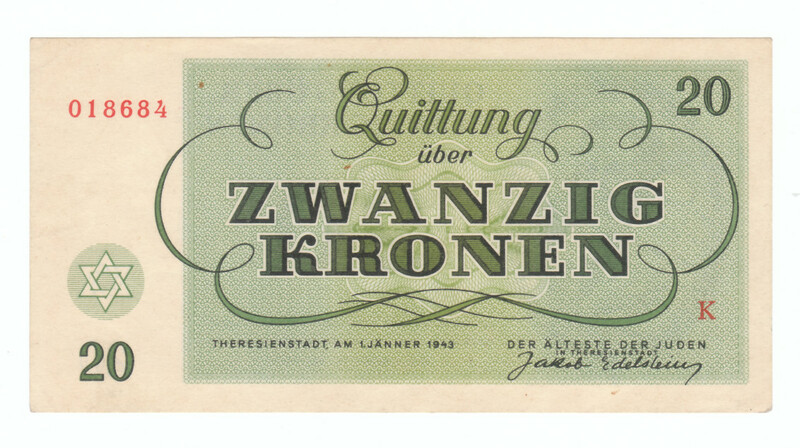 On the Simon Wiesenthal website there is an article about the numismatic aspects of the German camp-money, including the Theresienstadt banknotes. 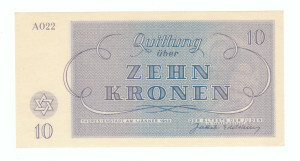 In the files of the trial of Adolf Eichmann is a statement of a witness, named Salzberger, that the Theresienstadt banknotes in use at the end of WW2 did not represent any value. 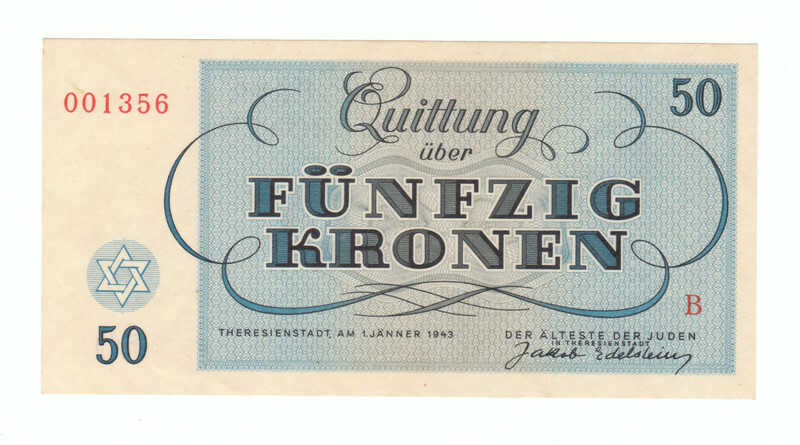 In the biography of Jindra Schmidt, an artist who designed banknotes, stamps, etc. 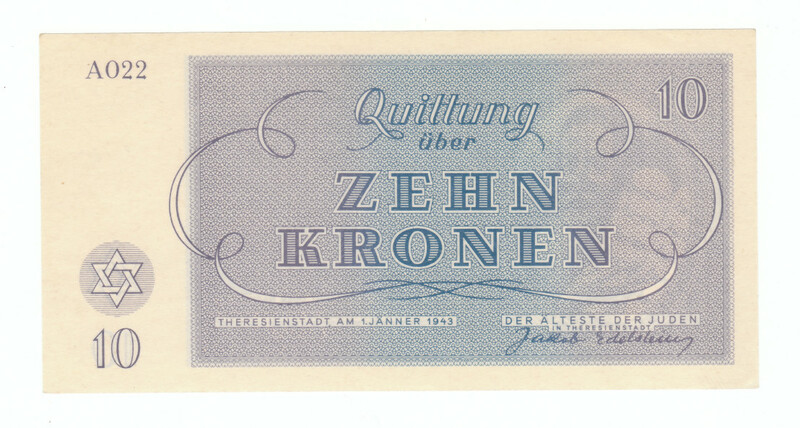 during and after WW2 in Czechoslovakia, we find more information about the process of design of the Theresienstadt banknotes. 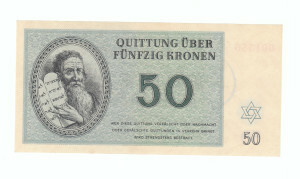 Prof. Dr. Nicolaus Heutgers comment on the Theresienstadt bank notes after WW2. On these websites there is more info about the International Committee of the Red Cross inspections at Theresienstadt: Link 1, Link 2.